A 16th century portrait has been found in a London home and some experts believe it is the only contemporary portrait of Lady Jane Grey in existence. Jane, a cousin of Mary I and Elizabeth I, was only 17 when her father-in-law, the Duke of Northumberland, tried to put her on the throne of England to prevent Mary, a Catholic, from assuming power. Nine days later Mary triumpantly entered London to assume the throne and Northumberland, his son, and Jane were put to death. For many years, most experts thought that this portrait was of Lady Jane Grey but now most believe it is of Catherine Parr, Henry VIII's last queen. Interesting. As they said, we'll never know for sure, but it's nice to see these pictures. It's funny that we have this idea that we know how people like Catherine Parr and Jane Grey and Shakespeare and Jane Austen looked, but often the images are from one or two sources and they aren't firmly verified. I don't know if it's the style of hair and headdress or just the way painters worked, but all these Tudor ladies look alike to me. Thank you for the info ysbel! Was it Mary I that ordered Jane's execution and did she subsequently become Queen? ZOOL - Ninja of the Nth dimension! Mary indeed ordered Jane's death, but if I remeber well, Mary was already Queen at that time. 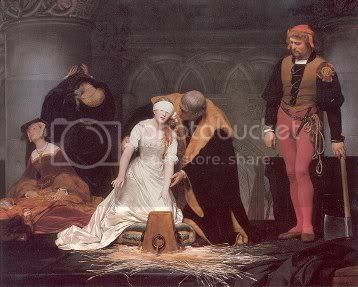 Jane was kept prisoner in the London Towerwhen Mary was proclamed and beheaded after being accused of treason and conspiration. I agree, poor lady! She was so young! It's quite curious by the way, that one painting about which the scientist weren't sure who it represented, crossed my path last week. 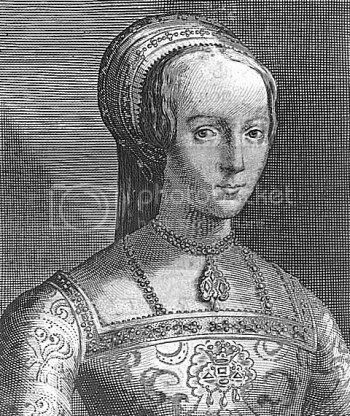 I was looking for some pictures of Henry's wives for an art project I'm in and than I stumbled upon this portrait, which (as the website said) could be Jane Grey or Catherine Parr. I decided that it had to be Catherine Parr, since it I needed a picture of her. I'm happy to see that I wasn't completely off the hook. Jane never seems to be included in the chronological list of kings and queens of England. If we get a queen regnant called Jane in the future, I wonder if she'd be Jane or Jane II. Yes, you're right Elspeth. An interesting historical fact is that Hans Holbein, the famous painter in the court of Henry VII, actually designed a lot of the court dresses and jewels. So the look that we most associate with the reign of Henry VIII and his wives was actually created by a foreign artist. I've looked at that first portrait a thousand times and I just have a hard time believing its Catherine Parr. For one, Catherine was 31 years old when she married Henry VIII and the girl in the portrait does not look 31 to me but rather a teenager which corresponds more to Lady Jane Grey's age. When you think of how quickly women aged back then, its even more astounding that the portrait could portray a woman in her thirties. Also, the girl in the painting looks small and we know Jane was particularly tiny. But Henry VIII liked big women so I don't think Katherine Parr was that small. 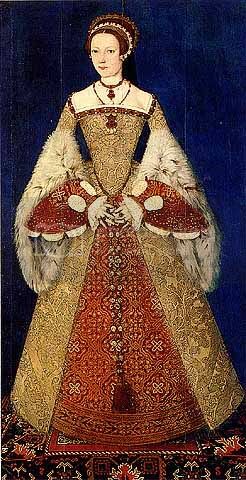 The main reason I heard that the portrait is thought to be Catherine is that the dress in the picture was catalogued in Katherine's possessions when she died. But Jane lived with Katherine for awhile and the fact that the dress was in Katherine's possesion doesn't necessarily mean that she ever wore the dress. Mary did order Jane's execution but at first, she was willing to pardon her. It wasn't until Wyatts rebellion (and his attempt to restore Jane to the throne) that Mary bowed to pressure from others (including Phillip) to execute her. I love the movie Lady Jane with Helena Bonham Carter...of course its the "Hollywood" version of her life but from what I remember...it wasn't a great one. 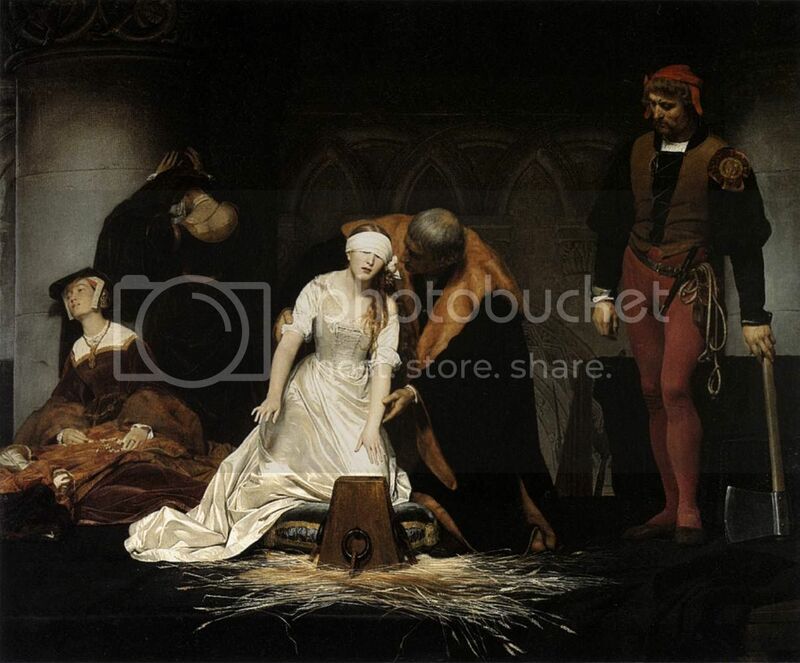 Treated like dirt by her parents, used as a pawn, forced to marry someone she didn't love, proclaimed queen when she didn't want to be and then executed...Shakespare couldn't have written a better tragedy. The Phillippa Gregory books are relatively historically accurate and give a pretty good description of how difficult it was to be a woman in that day and age (particularly if you had a will of your own). That era was difficult to live in regardless of your social status...and the more ambitious you were the more likely you were to die young and if you were guileless the more likely you would be used as a pawn. Hi Zonk, I know the movie you're talking about...they definitely romanticized Jane's marriage which looked like a marriage from hell in real life. I don't know if the story about her father taking part in Wyatt's rebellion is true. I do know from another great book A Crown for Elizabeth that Mary spared Jane's mother because they had been childhood friends but Jane's mother Frances seemed the most conniving of the lot. Oddly enough, Frances went to Mary to beg for her husband's life but made no pleas for her daughter. Perhaps Jane was a lost cause by then but it did make you wonder what kind of family Jane was born into. Ysbel...yes if I recall in every thing I have read about Jane's life...her mother made no attempt to beg for her daughter's life. I am not sure if the father had anything to do with the rebellion..but the thinking was if Jane was removed...no one could use her as a reason for their cause. If I remember it correctly, the only true mother figure poor Jane had in her life was Queen Katharine Parr. The whole Princess Elizabeth/Thomas Seymour dalliance messed that up for the girl as well. I would really like to know, if we had another Queen Jane, for instance, William's eldest daughter if he doesn't have a son, or William's eldest son's daughter if he doesn't have a son, would she be Queen Jane II? Or Jane I? I personally think she would have to be Jane II since Lady Jane Grey was actually the monarch of England, even if it was just for a very short period of time, it was a period of time nevertheless. I've wondered that too. My guess is that the next Queen Regnant called Jane would be Jane I because Jane Grey never seems to show up on lists of monarchs. Plus, the royal family seems to avoid "unlucky" names, so there probably won't be a Jane any time soon. It doesn't seem to have been used even as a third or fourth name for a royal baby for a very long time. If she would take/or would has the name of Jane. She was actually going to be spared by Queen Mary I if Jane converted to the Catholic Faith. She refused and was devoted to Protestantism. Therefore she died for her faith, and is in a way a martyr. 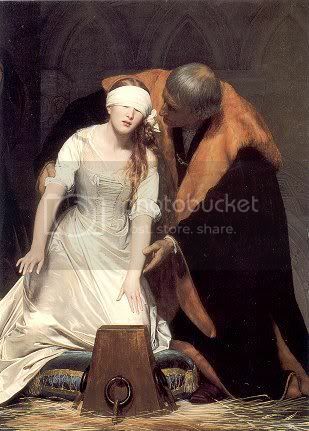 She was determined to die with dignity but when the blindfold was put on her she couldn't find the block to lay her head on, so she was helped to find it. It is so sad. Well she does crop up on some lists of English monarchs. On Wikipedia's list of English monarchs she is there. I think Magnik is right - the next Queen Jane will have to be Jane II. I hope there is one, I think it has such a nice ring to it. It is true that 'Jane' has not been a popular choice of name in the British Royal Family for a long time. I think perhaps it might be a myth that they are avoiding 'unlucky' names like John and Jane on purpose. They probably are not, they just haven't been used much for no particular reason.